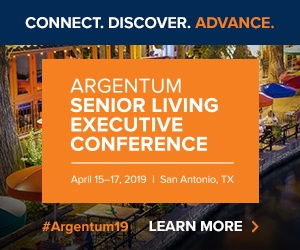 Advertisements for senior living communities all look relatively similar, and convey more or less the same ideas, Thrive Senior Living President Les Strech tells Senior Housing News. By being decidedly blunt, a new ad campaign from the Atlanta-based provider aims to “cut through the clutter” of bingo-playing seniors staring off into the sunset. Thrive currently operates 22 communities around the country, with half a dozen more under construction. Recently, the organization rolled out a new ad campaign—”Playing Favorites”—that’s meant to be both humorous and empathetic. In creating the ads, Strech was inspired by an unexpected source: fast-casual restaurant chain Chipotle (NYSE: CMG). To successfully attract new residents, senior housing communities should shy away from explicitly addressing the care they provide in their advertisements, Strech says. In fact, focusing only on the quality care a community offers is an “absurd” move, he argues. “You’re viewing people as objects in need of care,” he says. That’s fundamentally against what leadership at Thrive believes about its residents—and the company was determined to avoid “nurturing” terminology in its marketing materials. That “nurturer” voice is all too common in senior housing marketing, and its overuse contributes to many senior housing advertisements looking and feeling the same, Strech says. To ensure this was accomplished, Thrive hired a creative agency at the beginning of the year. The agency was tasked with conveying “radical honesty” about the purpose senior living communities serve, and the mindset Thrive has about its residents. The resulting ads are tongue-in-cheek, and remind Strech of a “no smoking” sign he once saw at a Chipotle restaurant. “Most ‘no smoking’ signs look the same, and say the same thing,” Strech says. Sarah Page | CC BY 2.0The sign at Chipotle was notably different—and fun—but conveyed the same message. It said that Chipotle burritos are so good, customers would want to smoke after eating one, but they could not do so in the restaurant. Strech hopes Thrive’s senior housing advertisements are as memorable, and as unique, as that “no smoking” sign. In total, Thrive invested more than $500,000 into its overall marketing strategy. The ads are set to run in every market where Thrive operates for about a year, or “as long as they get traction,” Strech added. Thrive is not alone in its quest to disrupt senior care advertising. Vancouver, British Columbia-based Nurse Next Door, for instance, has also attempted to take a straight-talking, provocative approach in its ads. The nation’s largest senior housing provider, Brookdale Senior Living (NYSE: BKD), featured real caregivers speaking about their jobs in a 2015 ad campaign. The Brentwood, Tennessee-based organization has said this national ad campaign successfully fed its sales funnel. Looking ahead, Thrive plans to expand its portfolio across the country. Soon, Thrive will be in two new states: Maryland and New Jersey. The provider is also aiming to guarantee all of its communities offer residents a “human experience,” rather than a “clinical experience,” Strech says. To that end, Thrive recently hired Tammy Marshall as its chief experience officer, who will help move that change along. “We want [every resident] to be viewed as a human, and not an object in need of care,” Strech says.